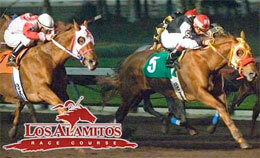 Better Than Ever will look for a repeat performance in the featured $13,100 allowance in the eighth race on Friday night at Los Alamitos Race Course. LOS ALAMITOS, CA—NOVEMBER 8, 2018—Ed Allred’s Better Than Ever lived up to her name when she last raced against allowance competition here on August 25. The daughter of Kiddy Up looks to repeat that performance when she takes on a solid group of 3-year-old fillies in the featured $13,100 allowance in the eighth race on Friday night. Trained by Scott Willoughby, Better Than Ever has always been a solid performer. In 10 career starts, she’s hit the board eight times and has finished first or second in seven of those outings. Her previously mentioned allowance win was a thing of beauty. She flew out of the gate to a clear lead and cruised from there on the way to an easy ¾ length victory. She followed that effort with a fifth place finish in the Girl Secrets Handicap, but she was fractious in that race and had trouble out of the gate. She made amends in her next start – on October 12 – when she finished second to Twisted Sifter in the Chingaderos Handicap. Twisted Sifter is the nation’s co-leader with seven wins in 2018. To be ridden by Vinnie Bednar, Better Than Ever will start from the outside post number six. Her rivals will include Grade 2 Golden State Derby finalists Yashira Vista and Perfect Louisiana and recent allowance winners Chickakid and Sweet 16.